The core building of the current Winchester cathedral was consecrated on this date in 1093. According to the Annals of Winchester, “in the presence of almost all the bishops and abbots of England, the monks came with the highest exultation and glory from the old minster to the new one: on the Feast of S. Swithun they went in procession from the new minster to the old one and brought thence S. Swithun’s shrine and placed it with honour in the new buildings, and on the following day Walkelin’s men first began to pull down the old minster.” In a somewhat cryptic and telegraphic way we have a statement here that puts in a nutshell how the great gothic cathedrals of England came to be: the old one was small and decrepit, so they built a replacement and tore the old one down after moving all the sacred relics from the old to the new. Then they continued to expand the new one. Medieval cathedrals were a neverending work in progress – not to mention the fact that bits fell down from time to time because architectural and engineering knowledge was lacking in spots. 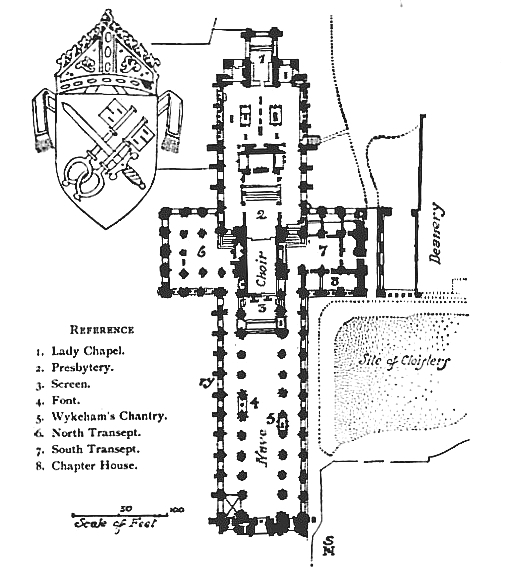 Winchester cathedral was founded in 642 on a site immediately to the north of the present one. This building became known as the Old Minster. It became part of a monastic settlement in 971. 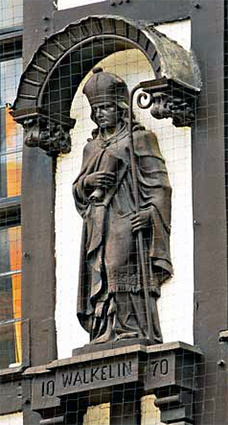 Saint Swithun (http://www.bookofdaystales.com/saint-swithun/ ) was buried near the Old Minster and then in it, before being moved to the new Norman cathedral. So-called mortuary chests said to contain the remains of Saxon kings such as king Eadwig of England, first buried in the Old Minster, and his wife Ælfgifu, are in the present cathedral. 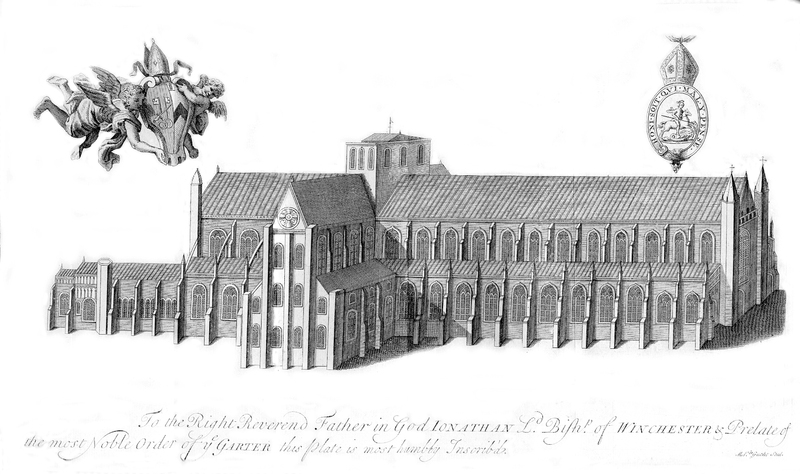 In 1079, Walkelin, first Norman bishop of Winchester, began work on a completely new cathedral. Much of the limestone used to build the structure was brought across from quarries around Binstead, Isle of Wight. Nearby Quarr Abbey draws its name from these workings, as do several nearby places such as Stonelands and Stonepitts. The remains of the Roman trackway used to transport the blocks are still evident across the fairways of the Ryde Golf Club, where the stone was hauled from the quarries to the hythe at the mouth of Binstead Creek, and thence by barge across the Solent and up to Winchester. A substantial amount of the fabric of Walkelin’s building, including crypt, transepts and the basic structure of the nave, survives. The original crossing tower, however, collapsed in 1107, an accident blamed by the cathedral’s medieval chroniclers on the burial of the dissolute William Rufus beneath it in 1100. Its replacement, which survives today, is still in the Norman style, with round-headed windows. It is a squat, square structure, 50 feet (15 m) wide, but rising only 35 feet (11 m) above the ridge of the transept roof. The Tower is 150 feet (46 m) tall. 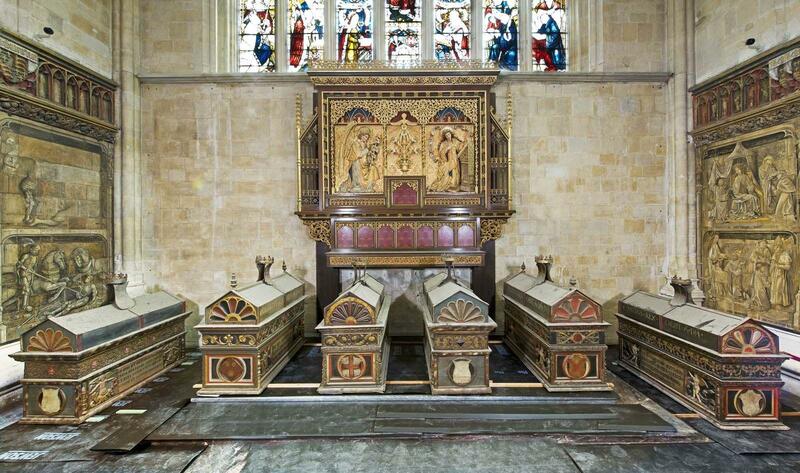 According to the Cathedral’s burial records the remains of some of the following may still be found in mortuary chests in the crypt: Cynegils, king of Wessex (611–643), Cenwalh, king of Wessex (643–672), Cynewulf, king of Wessex (757-786), Ecbert, king of Wessex (802–839), Ethelwulf, king of Wessex (839–856), Eadred, king of England (946–955), Eadwig, king of England and later Wessex (955–959), Cnut or Canute, king of England (1016–1035), Denmark and Norway, his wife Emma of Normandy (d. 1052) (also queen consort to Ethelred II, king of England), William II ‘Rufus’, king of England (1087–1100), Wini, the first Bishop of Winchester (d. 670), Alfwyn, Bishop of Winchester (d. 1047) and Stigand, Archbishop of Canterbury (d. 1072). Forensic anthropologists are currently examining the bones which have already been carbon dated to Anglo-Saxon and early Norman times. When I posted concerning St Swithun I was stuck for recipes and mentioned only a local cheese. But rural Hampshire is well known for game and for recipes to cook it. I am not sure how I missed this fact. Raised game pie is popular, but I have already given a recipe in another post. 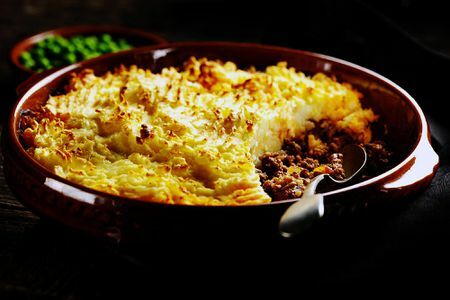 Instead here is a pie that is a version of cottage pie using game rather than beef. Season the game with salt and pepper to taste. Heat 1–2 tbsp oil in a heavy skillet over high heat, then brown the meat in small batches for a few minutes, turning it with a wooden spoon. Drain in a colander to remove all the fat. Heat 2 tbsp oil in a heavy-based saucepan and gently fry the onions with the garlic, juniper and chopped thyme until very soft. Add the meat, dust it with flour and add the tomato purée. Cook for a few minutes, stirring constantly. Add the Worcestershire sauce, then slowly stir in the cider and beef stock to cover. Bring to a simmer and cook gently for about 1 hour until the liquid has thickened. Check the seasoning and set aside to cool.